How Do W-Technologies, Inc. Hydraulic Shock Dampers Work? Blanking requires the press to build tonnage that exceeds the shear strength of the material. When this happens, the press frame and housings are loaded in tension. At the moment of material fracture, the resisting forces in the press are released and the press slide is allowed to accelerate downward at speeds that approach 10g's. 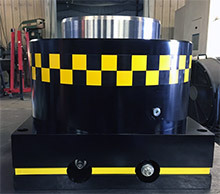 Sized and adjusted properly, the shock damper will automatically develop a resisting counter pressure force (through internal hydraulic pressure control) that will absorb the acceleration and eliminate the resulting shock and vibration.